Fourteen thousand feet above sea level in the South Andes of Peru is the City of Yauri. 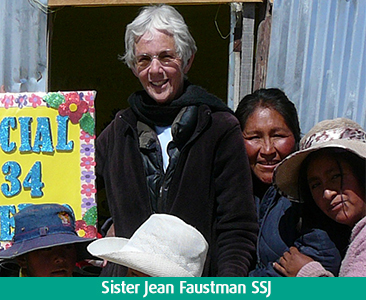 Sister Jean Faustman SSJ, an Associate Professor of French at Chestnut Hill College, lived among the poor of Yauri between 2006-2009. She has returned each summer to the place and people she loves. While there, she spends her time at the children’s shelter and with families who are poor. She brings with her the mission and charism of the Sisters of Saint Joseph and monetary donations to buy food, clothing, wheelchairs, walkers, and cribs. The highlight of this year’s visit involved a boy named Luis. Click here to learn more about Sister Jean.